A multidimensional experience at Aarhus Harbor opens up the discussion on challenges and solutions to climate change. Inside a giant globe construction on Aarhus Harbour, children and adults explore climate issues and learn solutions to combat climate change. The giant globe, which is the height of a five storey building, is called Climate Planet. Its mission is to move climate change issues to the top of the agenda in a multi-dimensional experience. In a 40-minute film, the audience is taken on a visual journey using global weather data to depict global climate change, starting at the Big Bang and reaching far into the future. Through live satellite transmissions, visitors see accurate images of Planet Earth and witness how it is affected in real time by changes to temperature, climate and extreme weather events. Climate Planet is a partnership between Aarhus Municipality and local organizations. The project supports the municipality’s masterplan for climate action by involving and mobilizing local citizens. Climate Planet is catalyzing debate about climate change challenges. As a corollary, it has also triggered discussions on how to provide solutions to climate change issues. In Aarhus alone, the enormous globe was visited by 40,000 guests, with 100 chosen guests producing a personal climate action plan. After showing in Aarhus, Climate Planet has travelled to Copenhagen and, most recently, to COP23 in Bonn. The Climate Planet, measuring 24 meters in diameter, was on display on Aarhus Harbor in 2017 when Aarhus was the European Capital of Culture. Climate Planet’s interactive visualization aims to develop visitors’ knowledge and skills needed to promote and mobilize sustainable development. Climate Planet contributes to increased knowledge and capacity for managing and navigating climate change. 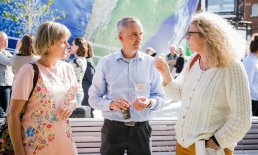 Climate Planet has resulted in collaborations across Aarhus municipality, between municipalities in Denmark and across national borders, as the globe travels from one city to the next.